Diverting Latin parlor game: take a very common Latin word (in the DCC Latin Core Vocabulary) that does not occur in Vergil’s Aeneid, and explain its absence. Why would Vergil avoid certain lemmata (dictionary head words) that are frequent in preserved Latin? Sometimes the reason is simply metrical (celeriter, imperator); in other cases, perhaps a word sounded too prosaic (cibus, servus, uxor, interim) for high poetry; sometimes a word just isn’t appropriate for the “prehistoric” period of the epic (provincia, praetor). Sometimes it’s a little hard to figure. Why not sapiens? Why not maiores? Why relinquo but not reliquus? Why vagor but not vagus? Check out the list below and let me know what jumps out at you. The Vergilian data comes from LASLA (no automatic lemmatizers were used, all human inspection), as analyzed by Seth Levin. To check its accuracy, search the DCC version of Frieze’s Vergilian Dictionary, which includes definitions and citations, as well as (LASLA-based) frequency data for individual lemmata. At times there might be some lemmatization issues (for example barbarus came up in the initial list of excluded core words, since Vergil avoids the noun, though he uses the adjective twice. I deleted it from this version). Ok, here’s the list. Enjoy! 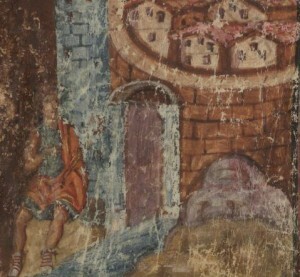 Image: detail of an illustration of Vergil’s Underworld, from Fulvii Ursini schedae Bibliothecae Vaticanae (Vaticanus Latinus 3225), also known as the Vergilius Vaticanus or “Vatican Vergil” (49r), magnificent illustrated codex written in Italy in rustic capitals at the end of the fourth or the beginning of the fifth century AD. Source: Digital Vatican Library. Peter Sipes, benevolus amicus noster apud Google+, has kindly made available a Google spreadsheet of the DCC Latin Core Vocabulary. Check it out, and download it. He uses it for those occasions when he is working without an internet connection. I wonder what he is doing with the list? Perhaps a guest blog post is in order. Peter? The core vocabularies have been on my back burner while I have been finishing up a book project of the dead tree variety while on leave from Dickinson for the fall ’12 semester. But I hope to return very soon to consideration of the semantic groupings in particular. My Dickinson colleague Meghan Reedy pointed out some flaws in the groupings on the Latin side, and we need to get that sorted before she and I move forward on our grand project: a poster that will visually represent the core according to its associated LASLA data, expressing visually each lemma’s frequency, semantic group, and relative commonness in poetry and prose. In the meantime, if you will be at the meetings of the (soon-to-be-renamed) American Philological Association in Seattle, please stop by the Greek pedagogy session and hear my fifteen minute talk about a way to use the DCC Greek core vocabulary in an intermediate sequence based around sight reading and comprehension, as opposed to the traditional prepared translation method. The papers on this panel each offer guidance and new directions for teaching beginning and intermediate Greek. First is a report on the 2012 College Greek Exam. Following are a new way to teach Greek accents, and a new way to sequence declensions, tenses and conjugations in beginning classes. Then we get a look at a reader in development that makes authentic ancient texts accessible to beginning students, and finally a way to make sight reading the standard method of reading in intermediate Greek classes.